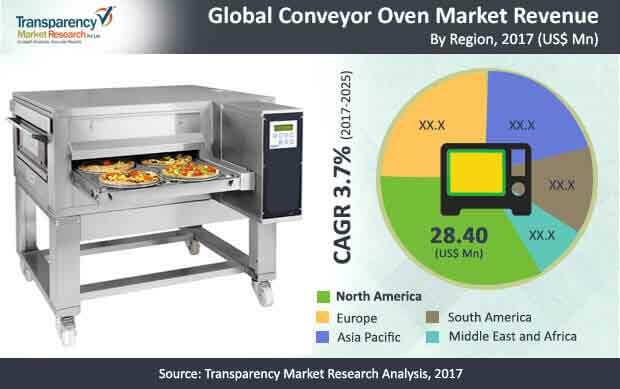 With the presence of a multitude of dominant players in the global conveyor oven market, competition is likely to intensify in the upcoming years, states Transparency Market Research (TMR) in a new report. The key vendors operating in the global conveyor oven market include Middleby Corporation, Lewco Inc., PICARD OVENS INC., Davron Technologies Inc., Star Manufacturing, Wisconsin Oven Corporation, Zanolli, Stoddart International Thermal Systems, Mahan Oven & Engineering Co. Inc., Infratrol LLC, Doyon, Moretti Forni, OEM-ALI Spa, Ovention, Italfornia USA, Lincoln, and XLT Inc. Product development and introduction of novel products are the key growth strategies that key players in this market have adopted to help them emerge at the fore. Besides innovations, several companies in the market are striving to tap opportunities in regional and local markets to target the segment of small end users. As per estimates of the TMR report, the global conveyor oven market will become worth US$123.2 mn by the end of 2025 at a CAGR of 3.7% during the forecast period from 2017 to 2025. Based on power source, electric conveyor oven held the leading more than 50% share in the overall market in 2016. Among the key type segments, industrial/heavy ovens stood as the leading segment of the conveyor oven market in 2016. Geography-wise, in 2016, North America stood as the most lucrative market mainly because of increasing demand for fast and convenient food. Rising demand for baked goods across the world is one of the primary factors driving the global conveyor oven market. Due to the increasing consumption of baked foods such as cookies, pizzas, and cakes, these ovens are playing a major role in the growth of food industry. Conveyor ovens are equipment in which food moves through a heated chamber in an efficient manner. Conveyor ovens are extensively used in the food service industry as they are efficient and consume very less time for food preparation. For instance, pizzerias display substantially high demand for conveyor ovens as they require considerably less time to prepare large amounts of food, thereby helping restaurant owners to attain operational efficiency. This, in turn, helps restaurant owners to provide a satisfactory experience to consumers. Over the last few years, the changing work practices of the food industry is also acting in favor of the growth of conveyor oven market. Food companies are seeking modern food preparation practices, wherein they are looking for quality and efficiency in a cost effective manner. In particular, stacked conveyor ovens are witnessing an increasing demand as they have the feature to cook a substantial amount of food at one time. This is also acting in favor of conveyors oven market. Furthermore, factors such as increased focus on energy conservation, efficiency, and demand for improved customer service in the food service industry are also anticipated to drive the growth of conveyor oven market during the forecast period. Key players are hard-focused on technological advancements in order to attain objectives of energy conservation and better customer service, which is aiding the growth of this market.